It is not certain when it first came into being but there was a ‘school house’ on the site of the Friars Walk school in 1824. At that time, it was a large single classroom with a dwelling house on one side and stable on the other; it also had its own small garden. It stood next to the graveyard that served a church which occupied almost the same position as the current Saint Modwen’s church, which was itself built to replace part of the derelict Abbey. The house at one time housed a schoolmaster but, by this time, it was no longer fit for such purpose. It was instead rented to a poor person and the schoolmaster rented a house in High Street, as did the usher – the only other member of staff. In the early eighteen thirties, the aforementioned Parish Church needed a classroom to accommodate its Sunday school. The trustees were approached about building one but it was decided, given that the building would only be needed on a Sunday, the best proposition would be to extend the school building so that it could be used on weekdays. The project grew to a complete, major, renovation in conjunction with the extension and including a new schoolmaster house. 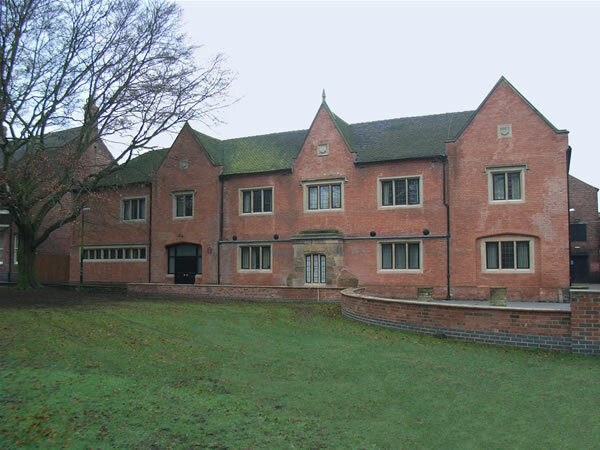 The plans were for the three gabled brick Tudor house more or less as it appears today. In 1834, the extensive renovation was completed, much of the cost being borne by the church. The cost of the renovation was £600! Thankfully, the building is sufficiently small to make it viable for modern commercial use. The right-hand section was the masters house, the left-hand section was the stables leaving the centre section for the school itself for around sixty pupils. former heyday before eventually being renovated to form the ‘new’ Grammar School. that building could be preserved as a commercial property. as a school, the main doorway was relocated.